Series of Nation-wide Yuva Samelan have been started in Assam as part of Ma. Ekanathji Janma Shati Parva. 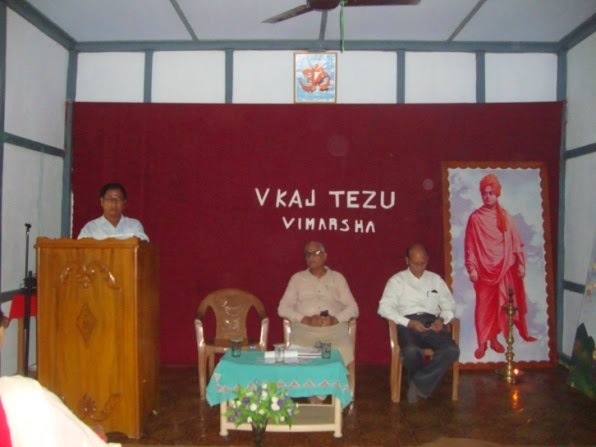 Vivekananda Kendra conducted various Nation-wide leadership programs for Youths. As part of these programs, presentation based on the Success Story of Vivekananda Rock Memorial has been shown in various collages followed by group discussions. Next step of these program is Yuva Samelan (Youth leadership camp). In Assam, Dhemaji and Lakhimpur districts inter-collage Yuva Samelan were organized by Vivekananda Kendra. Hundrads of Students participated in the "Yuva Samelan". It was 4 hours program, consist of small lectures on various subject like leadership, Swami Vivekananda, leadership games and group discussion on current problems and it's solutions. 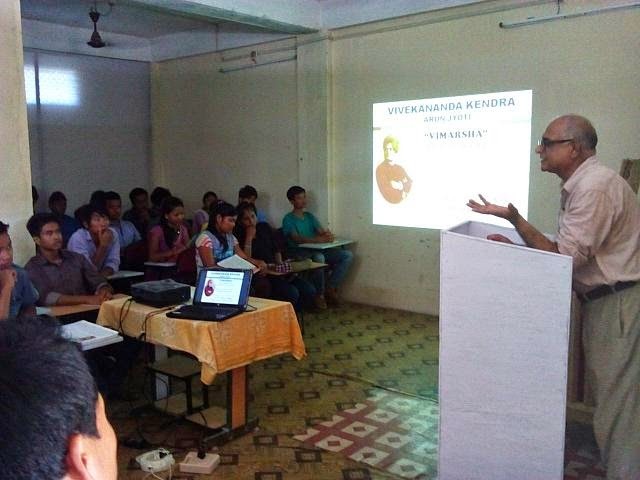 Vivekananda Kendra - Branch Vadodara organized a 3 days residential Personality Development Camp from 18th Oct to 21st Oct 2014 at Padra. Students who had participated earlier in one day camps after successfully completing SSK Pariksha, got themselves registered for the camp. 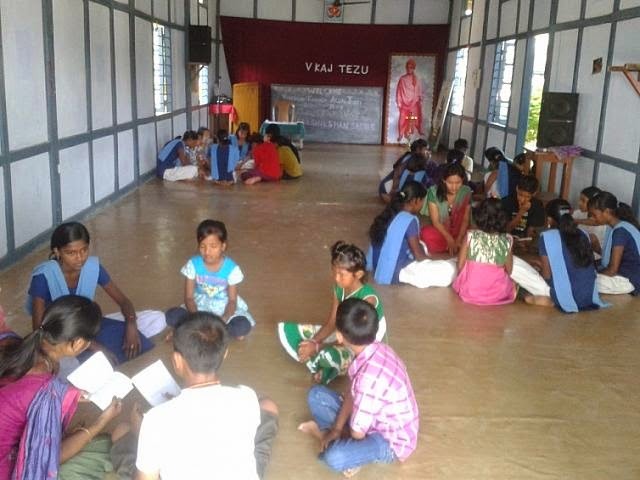 Total 179 students attended the camp of which 11 were college students. Forty Karyakartas including six Varistha Karyakartas worked for the successful organization of shibir. 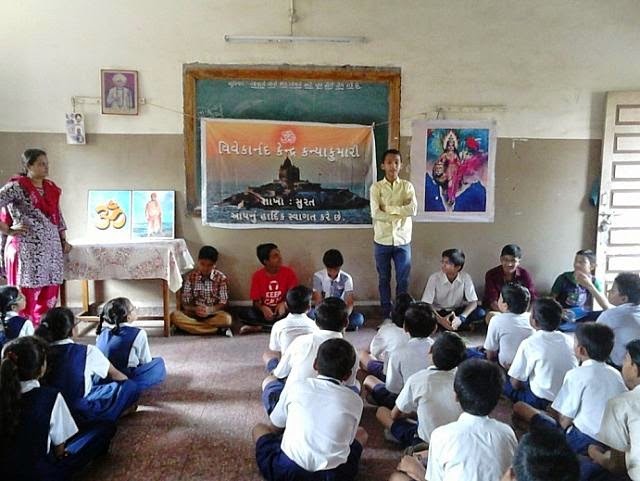 The Shibir was organized in Zen School in Padra, district Vadodara. The objective of the shibir was to increase Sanskar Vargs in Vadodara . Various sessions like 'Sanskar Varg kyu? ', 'Humara Parivar Arunachal', 'Rashtriya Suraksha- humara kartavya' were organised. On 2nd day everyone participated in Bharat Mata pujan. On 3rd and last day of shibir prabhat pheri was organized and shivirarathi's and karyakartas performed 108 suryanamaskars. 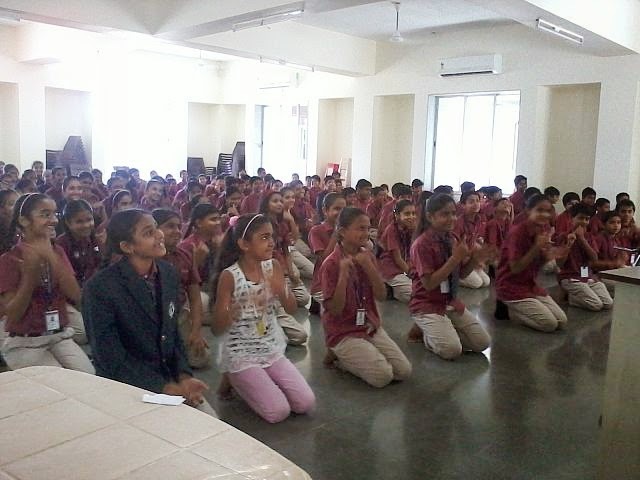 One day personality development camp were organized in Navasari at three different places AB School Navsari - 120, CL Parekh School - 123 and Divine School - 181. 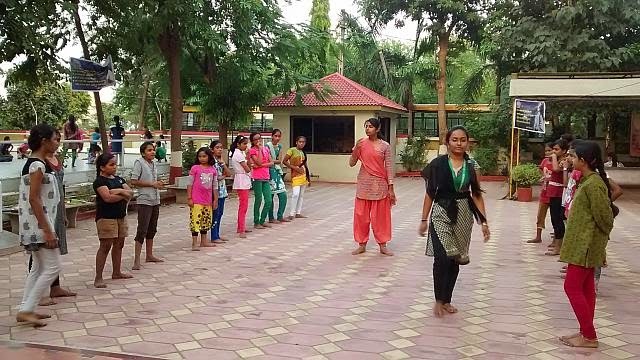 Various physical and mental games, patrotic songs and group discussions were the part of personality development camp. The Indian tendency, on the other hand, to represent the ideal, the supersensual, has become degraded into painting grotesque images. Now, true Art can be compared to a lily which springs from the ground, takes its nourishment from the ground, is in touch with the ground, and yet is quite high above it. So Art must be in touch with nature — and wherever that touch is gone, Art degenerates — yet it must be above nature. Art is — representing the beautiful. There must be Art in everything. राष्ट्रीय संगोष्ठी : जनजातीय समाज एवं जन संचार माध्यम : 18-20 June 2012 at Bhopal. 08.10.2014 Ignited Youth Forum of Vivekananda Kendra organised “YUVA VIMARSHA” a dialogue for creative leaders at IGG college Tezu. The topic of lecture was Timeless India – Resurgent India” The Programme was started as per Indian tradition with lighting of the lamp and followed by welcome speech. Aims and objectives were told by Shri Tajit Nalo. Dr. J.K. Bajaj, Director Centre for policy studies, New Delhi, Chief speaker delivered a lecture on “Timeless India- Resurgent India” he beautifully told through story how to manifest individual’s divinity and to work accordingly. He also urged student to contribute towards our country to make Bharat JAGAT GURU. 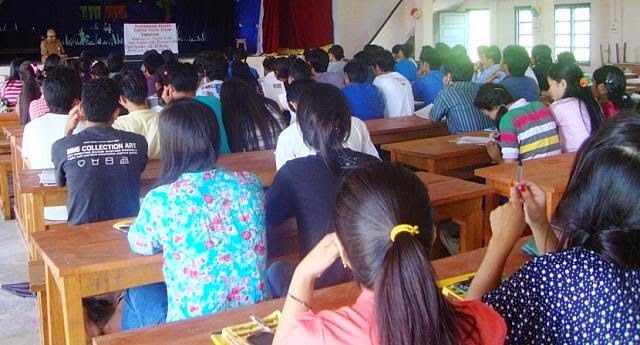 He also inspired student to use Knowledge as key for achieving success in life. He also stressed that Arunachal is rich in flora & fauna we should preserve this from explication. Principal of IGG college Tezu also spoke on the occasion and called youth to utilize all resources to make India great. Students asked the various question and answer were given by Guest Speaker. Shri C.C. Namachom, Member IYF and Asst. Professor of IGG college Tezu gave vote of thanks and prog was concluded with Shanti Mantra. Program was successful due to large participation of students. Safal Yuva - Yuva Bharat Presentation is based on success story on Vivekananda Rock Memorial has been Prashikshan at Tezu. MEJSP PPT. Presentation By Shri Taba Tatup, Prant Prashikshan Pradmukh, was conducted on 28/09/2014 Total 23 Karyakarta has participated. Vivekananda Kendra is a thought movement, a spiritually oriented service mission. Vivekananda Kendra Arun Jyoti Wakro has organized Universal Brotherhood Day at the Apana Vidya Bhawan, Wakro. 11th September which we celebrate as Universal Brotherhood is nearing. This is the day when Swami Vivekananda gave the message of brotherhood to the world in 1893 at Chicago. The programme was started with lighting of the lamp followed by Sanskrit mantra. Patriotic song was sung by karyakartas. Two students of Apana Vidya Bhawan, Wakro delivered a Chicago speech. Sri. Takelum Billai, Advocate spoke that if there has to be peace in the world then the exclusive approach to the religion – My religion alone is true - would have to be given up. The universal brotherhood is possible only when the different religions and ideologies respect and accept the right of religions and ideologies other than theirs as true and valid for their respective followers. Chief Guest Shri. Patam Rangmang, ZPM, Wakro spoke regarding the need of brotherhood feeling in present situation. Vivekananda Kendra is doing a exemplary work by celebrating Universal brotherhood day and must continue the work of ‘MAN-MAKING and NATION- BUILDING’. Bio-diversity is one of the important aspects that has to be studied, documented and conserved at Rameshwaram.Rameshwaram island is one of the chain of islands that are present in the Gulf of Mannar bio-diversity hot-spot region.Read about it and its importance in the newsletter. Shells, Coral Reefs and Sea algae - the bio-diversity of this island needs to be showcased and this is a small beginning. Also find out about the renovation work of Ramar Teertham. We have excellent press coverage of the event. We have shown the condition of the teerthamprior to the renovation. In our happenings section read about such diverse activities as training in Azolla to farmers from Jharkhand to rainwater harvesting workshop to 'workshop on “Traditional Siddha Varma Bone Setting Practices.” Green Transport is an important aspect of environmental living. Battery operated vehicles eliminate pollution. We have introduced battery operated vehicles in our campus. Also learn about training programmes in Bio-methanation plant as well as installation of new plants. Also learn about the UNICEF sponsored programmes that VK-nardep conducts in different parts of Rameshwaram which include the green health camps as well as hygiene awareness camps. VK-nardep also participated in the district book exhibition with its own stall and showcased the panels depicting 'Green Rameshwaram' to more than 20,000 people mainly school and college students. In the publication section we provide a collection of eco-toons that offer a critique of consumerist society. As this newsletter will reach you in the month of October we also have given quotes of Gandhiji. In our wisdom section we have Ian Maccallum author of 'Ecological Intelligence' showing how the animals whom we even despise and which are untamed and wild are part of our own being - our soul mates. We have a passage from Swami Ranganathananda which explains how a unity runs through all diversity. Then we have an article on 'transpersonal ecology'. To those of us who have heard about only transpersonal psychology - now we know what is transpersonal ecology. So you can download it all and read. The whole world is nothing but a magnificent Puppet Show. So says Kerala’s great poet of satire and originator of famous Ottanthullal. According to him, the director of the cosmic show goes on pulling the threads that make us move our head, hands and feet, that is, dance to his tune. When he pulls out the threads, lo, we fall down dead. 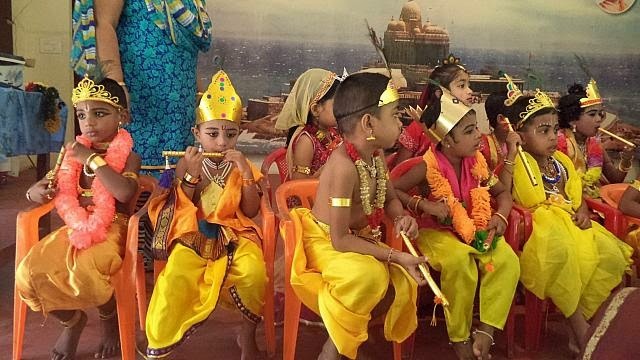 Isn’t the whole world then a ‘BOMMAKOLU’ where crores and crores of dolls or puppets – human beings, animals, birds and countless other organisms are made to play their part in a mega cosmic drama. Each man and woman thinks that he /she is the best actor and his/her acting is the best. Little do we realize we are all puppets and the one who pulls the threads remains invisible. We have to dance to his tune and when he pulls the thread, off we fall down dead. This being a fact, why can’t we behave more responsibly, more pleasingly and dance more rhythmically and live more purposefully. 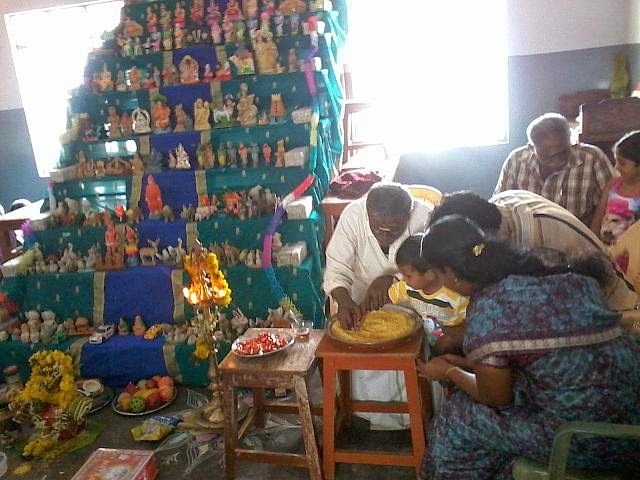 Each doll in the bommakolu is a reflection of ourselves as is every creation in the universe. In Sri Sankaras words “Viswam dharpanamana nagari” – the world is a mirror. Let us, looking at the dolls in the bommakolu, learn to expand our understanding to include everything and remain happily attuned to all the creations in the universe. Vasudhaiva kutumbakam is the message that the bommakolu gives. Meditate on the great truth that we are nothing but puppets in the Lords hands. Sanskar varga sammelan was conducted on 5/9/2014, Sunday from 04:00p.m to 6:30p.m at Punagham. There were the 4 sanskar vargas (Udhana Sanskar Varga, Dindoli Sanskar Varga, Ambika-2 Dindoli Sansakra Varga & Punagham Sansakr Varga) were merged and the sammelan was conducted by the Vaga Shikshakhs of Sanskar Varga of the 4 SV running at Surat. There were 48 in total in which 9 karyakartas were present and 39 Sanskar varga Children. 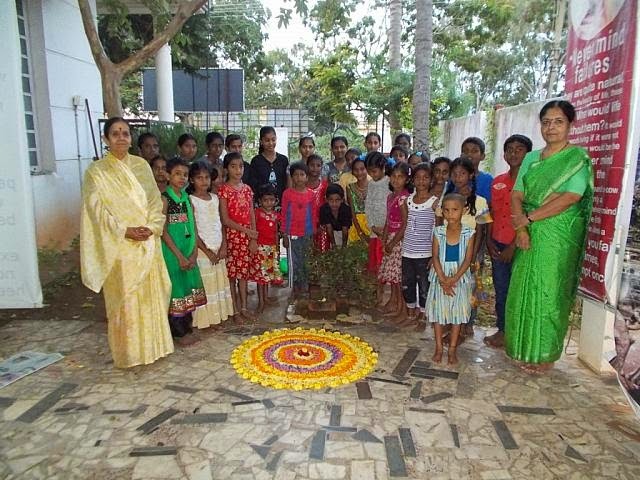 In our school, We celebrated Vijaya Dasami & Vidyaramba in a grand manner on 03.10.2014. This ceremony commenced with devotional prayer song by our teacher.Next One of teacher welcomed the gatherings of the function.Shri. Ayyappanji,Secretary of RDP, Vivekananda Kendra as a chief guest made a great privilege for us and started the Vidyaramba ceremony. Next our school Correspondent Mr.S.K. Subramanian felicitated the function and completed the Vidyaramba with a great inspiration. Many parents with their children participated with interestingly in this function.Next our new admission students wrote the great Manthra ‘Ohm’ in the turmeric rice.Prasatham was distributed to all.At last the celebration came to end with Kendra Prayer. 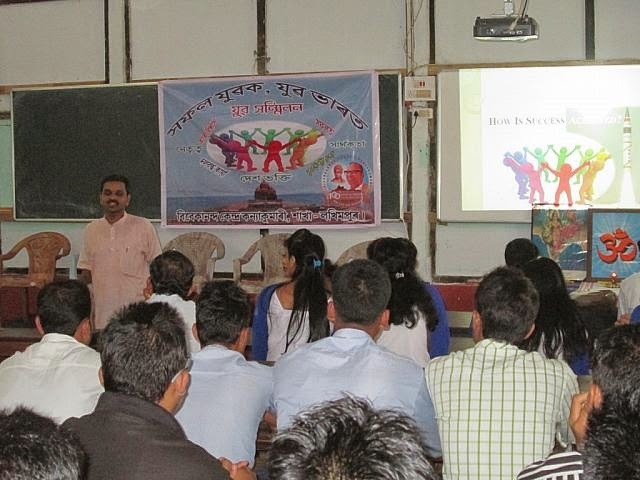 Vivekananda Kendra Branch Vadodara have organized Youth convention on 28th of September 2014. Under the banner of Vimarsh we had registered 227 participants especially students from different colleges and faculties of vadodara for the convention, out of which 175 participants participated that day. Various sessions were designed for the 3 hour convention. First session was interactive questionnaire in which a set of activity based questions were discussed with the participants and they ranked themselves according to their 5 fold development. 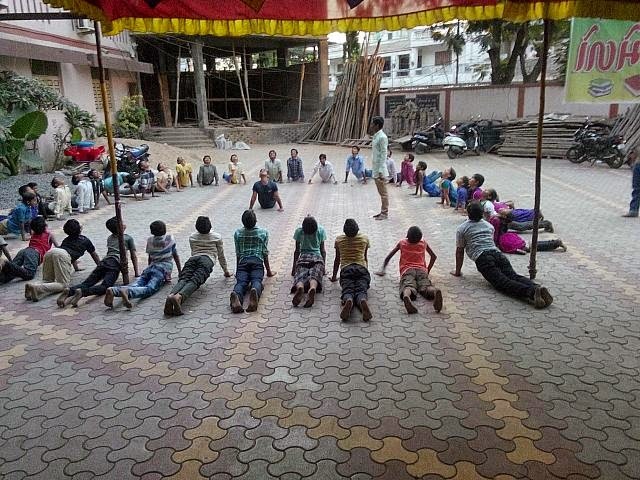 Youths enthusiastically participated in different team building games and actively involved in the group discussion “My role in resurgence of India”. The guest and speaker of the convention was Dr. Sharad Thaker, renowned gujarati writer, columnist and gynecologist. His motivational articleshas saved lives of 52 people from committing suicide. His speech on “ Safal Yuva- Yuva Bharat” mesmerized everyone and rejuvenated the zeal of patriotism in the young generation. Through the life examples of Swami Vivekananda he touched each element of 5 fold development namely, Physical, mental intellectual, spiritual and emotional. Dr. Sharad ji said “ Youths are those who only do ‘ Sankalp’, there is no ‘vikalp’ for youths”. He inspired youth to dream big and work harder to achieve it and devote maximum possible time for developing their personality for service of nation. Dr Sharad Thaker also answered the questions of participants. The convention was followed by lunch. Every participants were given certificates and books of Swami Vivekananda. We get overwhelming and enthusiastic response from youths for our Kendra activities. Safal Yuva - Yuva Bharat Presentation is based on success story on Vivekananda Rock Memorial has been conducted at Vetenary collage on 11th September having presence of 100 students and in Krushi University on 13th September having presence of 93 students. 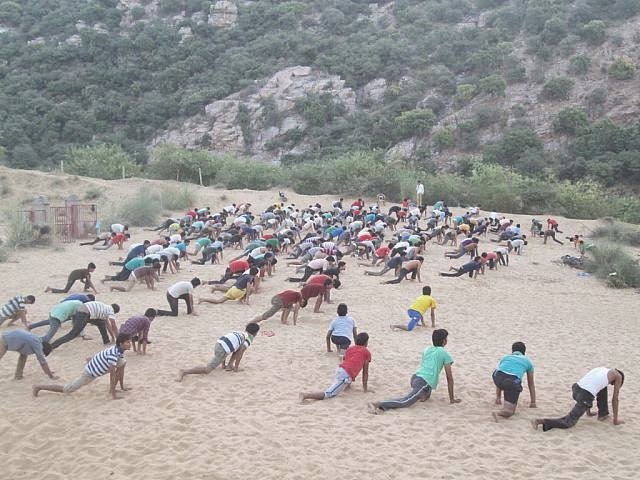 A daily yoga varga is running in Gujarat University Hostel, Karnawati in morning 6 to 7:15. 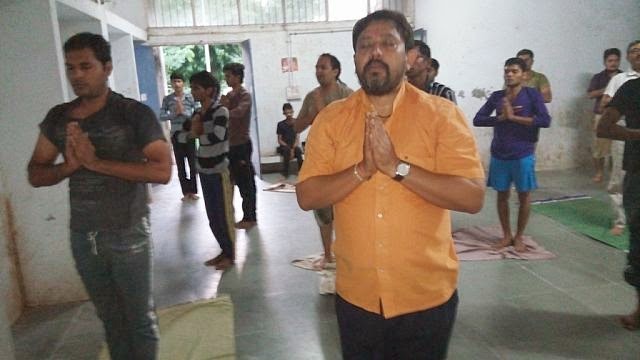 Dr. Kamlesh J. Upadhyay Professor of HOU - Medicine Department has given talk on "जीवन कि राह" and "How Yoga Connected to Life". This talk helped to youngsters to choose their path of life. Some of the students shared their exprince that "Daily practicing of Yogasana helps them to transform their whole day with more energy in each and every activities." Universal Brotherhood Day was celebrated in Odisha Pranta with all gaiety and show. Bhubaneswar branch celebrated it at Engineer’s Association. Swami Atmaprabhananda, Secretary Ramakrishna Mission Bhubaneswar, was the chief guest and Shri. P. Brahmananda was chief speaker. Swamiji emphasised on the applying the thoughts of Swami Vivekananda in today’s scenario where religious intolerance is visible in the Middle East. Swamiji also told the importance of all speeches delivered by Swami Vivekananda in The world Parliament of Religions. Shri. Brahmananda told the greatness of Swami Vivekananda as he was the first person to talk about Universal Brotherhood from the western platform. A skit was presented by the Karyakartas of Vivekananda Kendra on the theme, “Relevance of Swami Vivekananda’s Message in today’s context”. Also the prizes were distributed to the winners of “Samartha Yuva Karyakrama” and “Chicago Speech Recitation Competition”. Brahmapur Branch organised a “Chicago Speech Recitation competition” for school students on 7th September. 43 students from 10 schools participated in it. The prize distribution and Universal Brotherhood Day function was organised on 11th September. Su. Anjana Panda, Commissioner, Brahmapur Municipal Corporation was present as Chief Guest and Prof. Madan Mohan Mahapatra was the Chief Speaker. Prof. Mahapatra focussed on Swami Vivekananda’s teaching of Practical Vedanta and concept of Oneness. He also emphasised on the need and relevance of Swamiji’s message of universal brotherhood in present scenario when the world is facing religious fanaticism. Swami Vivekananda wanted India’s conquest of the world by the power of Spirituality and by not muscle power. Su. Anjana Panda told that she is very happy to attend the function as she was the one who got her first prize in her school days on the same occasion. Also shared that Swami Vivekananda will help us to lead to success in life. Dr. Gopal Krishna Panigrahi, Nagar Pramukh Vivekananda Kendra welcomed the guests and Nagar Sanchalak, Prof. Kishore Ch. Raut told the importance of the day. Kum. B. Harisha and Kum. Srabani Panda, the winners of recitation competition recited the famous Chicago Speech in English and Odia. Banpur Branch organised a motivational programme for youth from 3 colleges in the vicinity. 200 youth and 40 well-wishers participated. Dr. Debadatta Sahani, Social Worker from Kendujhar was Chief Speaker and Prof. Vijay Kumar Nanda was Chief Guest. Prof. Nanda, detailed about the Chicago Speech, the context, the meaning and the impact. He also told the youth about their duties towards society. He said, Success in Life is not enough but Successful Life is important. In continuation with this thought Dr. Sahani gave a beaconing call to youth to work for national regeneration. Su. Pranjali, Vibhag Sanghatak also motivated the participants to work for nation and how we can start it with our college, our town and our state. Gunupur branch organised a Prize Distribution programme for the winners of “Uttishthata! Jagrata! 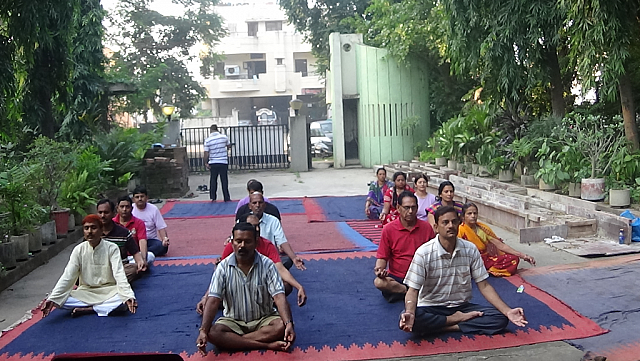 Yuva Pratiyogita”. Dr. Jawahar Choudhury was the Chief Guest and Shri. Ravi Naidu, Pranta Sanghatak, VK Odisha Pranta was Chief Speaker on the occasion. Shri. Jawaharji told about the glorious Indian History and Swami Vivekananda’s Love for the country while Shri. Raviji focussed on the message of Universal Brotherhood and ‘acceptance not tolerance’, ‘Help not Fight ’. He also cited the events from Sri Ramakrishna’s of Universal Acceptance and intense love for Human Kind. Baripada Branch organised a function at Rotary Bhavan where 150 people participated. Chief Guest was Dr. Damayanti Besara, a Sahitya Academy winner on Vanavasi (Tribal) Literature and Chief Speakerv was Manoranjan Mohanty, Reader in English at Jaraka college. While speaking he explained how Bharatiya Sanskrirti and Sanatan Dharma are all Inclusive and there is no word like exclusive approach in our literature. He also explained Swamiji’s great contribution to humanity by participating in World Parliament of religions. A One Day Odisha Pranta Nagar Pramukh Varga was organised on 21st September 2014 in Bhubaneswar. Nagar Pramukh and Sah Nagrar Pramukh from all Nagars, All Sanghatak and Pranta Team was present for the varga. The varga started with 3 Omkar, Shantipath and Aikya Mantra. Aadarniya MEJS Parva Pramukh, Shri. Rabindra Kamila welcomed all and told the purpose aand importance of the varga for expansion and consolidation of Kendra Karya. Mananeeya Pranta Sanchalak Shri. Surasen Jena ji said, “Mananeeya Ekanthji was a master organiser. The karyakarta is LIVING example of Ideals of organisation and so our responsibility is much more. If we are ready to work for nation with the zeal then we can achieve our target even if our number is less”. It was followed by Karya Parichaya Satra, Nagar Pramukhs introduced their Nagar Sthans with respect to karya, sstrengths, team etc. It was continued by Manthan conducted by Aadarniya LakshmiNarayan ji, Prakalpa Sanghatak, Utkal Seva Prakalpa on “The Role of Nagar Pramukh”. Shri. Rabindra Kamila presented the Karya-yojana of MEJSP. In Samapan, Shri. Mahendra Singh ji, Vishesh Samparka Pramukh, MEJSP, told that, Youth should work for national cause and ours is the work to take Swami Vivekananda’s thoughts to youth. Mananeeya Ravi ji, Pranta Sanghatak, Odisha stressed on conducting a day long Chintan Baithak at Nagar Sthans for Vision 2016. How our Nagar can become a PURN NAGAR? Also we should give a thought to raise our level, our Intellectual, Emotional And Spiritual level should be raised. The varga concluded with Kendra Prarthana. And O Devi Mahamaya (the Great Enchantress), by Your Will, You can also Forcibly Attract their Minds towards Delusion (such is Your Power and Divine Play).